Your Ninjas must defend the honor of their dōjō against a rival dōjō. Victory hinges on eliminating Ninjas and skillfully venturing into the opponent’s dōjō. But how far do your Ninjas dare to go…and will they return? Every move is critical as you position your Ninjas for defense and ready them for their mission! Ninja Versus Ninja from Out of the Box Publishing is a two player abstract strategy game designed by Tushar Gheewala. Each player controls a set of six ninjas that are trying to protect their dojo, while simultaneously trying to invade their rival’s dojo. You score points based on how far you make it into your opponent’s area and back in a set number of turns without being captured. The winner is the player who scores seven points or captures all the opposing player’s ninjas. On a player’s turn, he rolls the dice and moves his ninja the number of space indicated by the dice. He can move his ninja in either a straight line or in an “L” shape. The ninja can do a reversal movement while in an opponent’s dojo. You can opt to combine the reversal movement with the “L” shaped movement. If a ninja’s movement doesn’t end on top of another ninja he has to move around him since the other ninjas is blocking his path. If a ninja’s movement ends on top of another ninja he has captured that ninja. Remove captured ninjas from the game. Once a ninja leaves a his dojo, indicated by the bamboo flooring on the game board, to invade his opponent’s dojo he is on a mission. That ninja has three turns to complete this mission. Capture results after three turns. A mission consist of invading an opponent’s dojo and returning to your own. The further you venture into your opponent’s dojo the more point you score. The only complaint I have is the swords on the ninjas. The soft rubbery plastic is not rigid enough. I would prefer hard plastic ninjas, but I can live with how they are. Easy to learn rules, quick gameplay, and quality components make this game a great addition to anyone’s collection. I initially purchased this game with my kids in mind. I didn’t think this game would challenge an adult, but I was wrong. There is enough strategy for adults to enjoy, while keeping things simple for a child. So when your child ask to play Ninja Versus Ninja, you’ll be able to enjoy it as much as them. I would recommend this game to anyone with children. It would also make a fun filer at a game night as well. When I discovered that my husband ordered a copy of Ninja Versus Ninja cheap on eBay, I got a chuckle out of it. The game looked adorable, and I’m a sucker for the cute factor. However, I fully expected that when the game arrived in the mail, we’d take the pieces out, giggle gleefully, and then box everything back up and on a shelf to collect dust. Aside from its novelty value, I didn’t exactly expect much from the game and was already anticipating the moment when we would be putting it in a yard sale. Although, when it arrived, I discovered there was more to the game than I had expected. 1.Theme: I really liked how well done the theme was for this game. All the little ninjas were very well done – these pieces are very cute and the attention to detail is nice for a game like this – their attire looked like what a ninja would wear, and they went nicely with the ninja masters and shadow ninjas. The board was beautiful with the bamboo squares for the dōjō and the throwing stars marked the shadow track and the scoring track. The name of the game is written on the board in a very ninja-inspired looking font. Even the two, four-sided dice continued the use of the ninja theme as they had swords going through them. It all just looked really sharp and held together well. 2.Game Play: I was pleasantly surprised by how much I’ve enjoyed playing this game. The games can go very fast and the tide can turn quite quickly, but they are very addictive. “Again, again,” I cry, after a particularly satisfactory victory, and I’m just as quick to demand a rematch after a disappointing defeat. While I expected this to be a kid’s game, I discovered there is a fair amount of strategy involved, which will appeal to adults who might not have expected it from this game. When it seems that the game is lost, sometime placing your ninja in the path of the enemy is the only way to keep the other side from getting that winning score. 3. Overall Quality: The board was well done, the box insert has plenty of room to hold all the pieces comfortably, and the pieces all feel very durable. This is a terrific game for the price. Actually, for what the game is, everything really works for me. (I did rate it a 10 after all.) If I had to come up with something, the swords are a bit bendy, but I don’t have any concerns that they will break. Also, the game we picked up was used, and our dice are starting to wear on the edges. Mainly, I don’t like losing a game (I get very attached to my ninjas), but I don’t hold that against Ninja Versus Ninja or Out of the Box Publishing. Seriously? Buy it already! You can get the game for about 23.00 bucks (and you may be able to go cheaper if you look for a used one). At that price, it is a steal for something that can provide hours of entertainment. It is super-easy to learn, the games are quick and so much fun, and it is perfect if you ever secretly wanted to be a ninja. The basics are you roll dice and move ninjas. You have 3 moves to get in and out of enemy territory and the farther you made it in, the more points you receive. First one to get 7 points wins! So easy and yet kind of addictive. Like I said, add it to the collection and you’ll find yourself using it in all kinds of situations. We had games where one side dominated the other – killing all but one of the opponent’s ninjas or just needing one more point – and a series of bad dice rolls allowed the other side to come from behind and win. It was exciting and quick and being at the mercy of the dice meant no one could dominate for long!!! 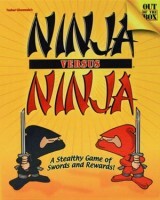 Add a Review for "Ninja Versus Ninja"